Cryptocurrencies experienced significant interest during the past 2 years. Many investors and companies became attracted to the market because of the apparently high returns they could get from this new asset class. At the same time, those investors who bought cryptocurrencies in late 2017 sustained a significant loss and drawdown in the bear market of 2018. Among these investors there were ICO companies and crypto miners, who were long cryptocurrencies because of the nature of their capital raising process and operations. These experiences made people realize the importance of having a proper risk management framework in place to handle the extreme volatility level and risk present in the crypto market. A possible way to reduce price risk for crypto holders is to implement a passive or active crypto hedging program. In this article, we outline how investors can hedge their crypto exposure and the relative transaction costs. In particular, section 1 discusses various methods of hedging a cryptocurrency exposure. The second section performs a transaction cost analysis (TCA) on the previously introduced methods and estimates transaction costs as a function of traded notional. The third section concludes. 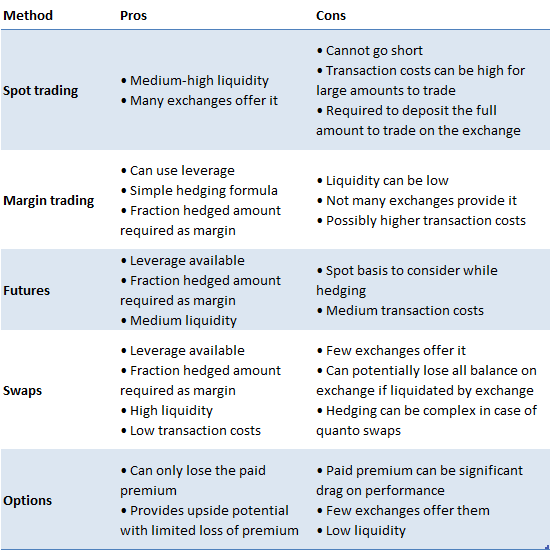 Table 1 shows the main methods to trade and hedge crypto holdings, with both advantages and disadvantages. In the next subsections we review the characteristics of each method. Spot trading is the simplest and most common method to trade cryptocurrencies. In order to do this, people need to deposit an amount of fiat on the crypto exchanges where they want to trade and start buying crypto. The main disadvantage is that investors cannot go short, so they cannot profit from bear markets like the one in 2018. Liquidity for spot trading is usually quite high, and it is available on many exchanges all over the world. Margin trading consists in being able to trade depositing only a certain percentage of traded notional (leverage). Usually with margin trading comes the ability to borrow and short sell cryptocurrencies through loans from other participants on an exchange. In order to do so, the borrower will pay a margin fee to the lender to compensate him for the service. 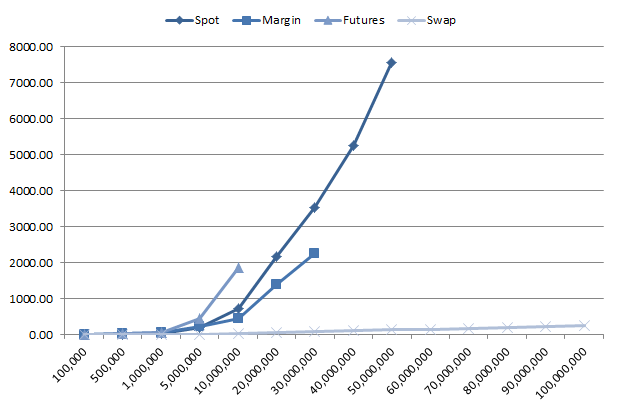 The major benefit of trading of margin is the ability to go short, hence potentially profit from bear markets, even if in these cases margin costs are likely to be higher. Additionally, hedging a crypto exposure is possible and only a fraction of the total hedged amount needs to be deposited on the exchange. Liquidity on exchanges that offer margin trading is usually medium high, so transaction costs are medium-low. Futures are a derivative contract that allows investors to participate in the underlying crypto market without holding it. 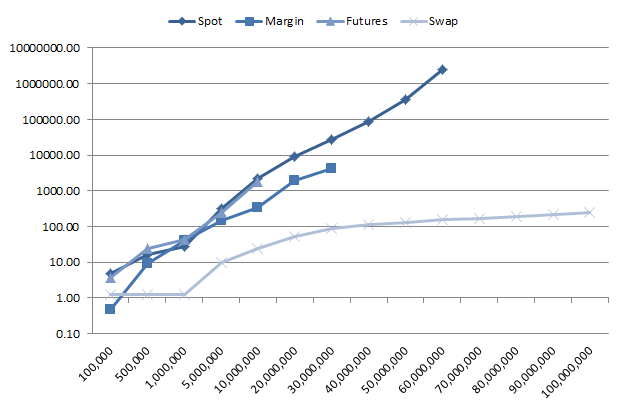 The main benefit of trading futures is the embedded leverage and possibility to go both long and short. Because of it, an investor like an ICO company or a crypto miner can hedge its position just by depositing a fraction of the entire amount. Liquidity for crypto futures is usually medium, and the product is offered only on a few exchanges. In addition, while hedging basis risk, i.e. the difference between the futures price and the underlying spot price before the settlement date, needs to be taken into account. Swaps are derivative contracts that allow two counterparties to exchange payments according to a specified method. Similarly to futures, they allow the investor to go both long and short, and require only a fraction of the traded notional as margin to open a position. In addition, they have very low basis risk, since the counterparties receive payments on a frequent and periodic basis given by the difference between the swap price and the underlying spot. Liquidity is usually very high, allowing big holders of cryptocurrencies to hedge their position with the lowest transaction costs available across all analyzed methods. At the moment, only a handful of exchanges offer trading in crypto swaps, and participants on some of these exchanges can potentially lose all their margin or balance on exchange if liquidated. Furthermore, hedging can be quite complex for a quanto swap (e.g. Ethereum), where the correlation with another instrument needs to be taken into account. Options gives the buyer the possibility, but not the obligation, to buy (call) or sell (put) the underlying instrument at the given strike price at the maturity date (European style). In other words, crypto holders can buy the required amount of put options to limit their losses if the underlying crypto price goes below a given strike price. This allows investors to participate in upside potential, but limit downside losses. This benefit comes though at the cost of expensive option premia to be paid to the option seller to compensate him for the insurance risk taken. Very few exchanges offer crypto options as of March 2019, liquidity is very low, and transaction costs quite high. This makes option hedging not a viable method to hedge an exposure for large holders of crypto like ICO companies, miners, or other institutional investors. This section analyzes the transaction costs incurred in trading cryptocurrencies, in particular Bitcoin, used the methods outlined before. We found that liquidity for trading options is very low, in the order of thousands of dollars, so we omit the analysis for options as a consequence. We used exchanges representative of each type of trading method. In particular, we chose Coinbase Pro for spot trading, Bitmex for futures and swaps, and Bitfinex for margin trading. Using order book data as of April 1 2019, we analyze the market impact costs of executing immediately an order ranging from $100K up to $100 million. The costs are expressed in basis points (1 bps = 1 / 100 % = 1 / 10000) and include both spread and market impact. The costs do not include fees charged by the exchange as they are usually dependent on monthly trading volume, but they roughly range from 7.5 bps to 20 bps for traded notional. 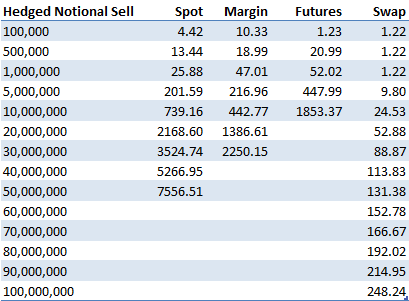 Table 2 and Figure 1 show the transaction costs in bps for executing a sell order for various amounts of traded notional. As it can be seen from them, in order to hedge some crypto holdings by going short an equivalent amount in spot or derivatives, swaps have the minimum transaction costs being the most liquid. At the same time, all other methods incur transaction costs which are exponential in the traded amount. 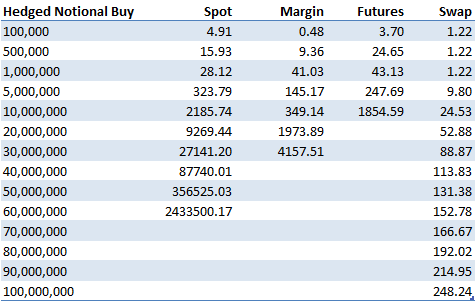 Table 3 and Figure 2 show the transaction costs for executing a buy order. The same conclusion for the sell order applies in this case, with the linear transaction costs for swaps and exponential for the other three methods. We now quantify the relationship between traded amount and transaction costs. Figure 3 shows it for spot trading in Bitcoin on Coinbase Pro. Figure 4 shows the relationship between traded notional and transaction costs for swaps. 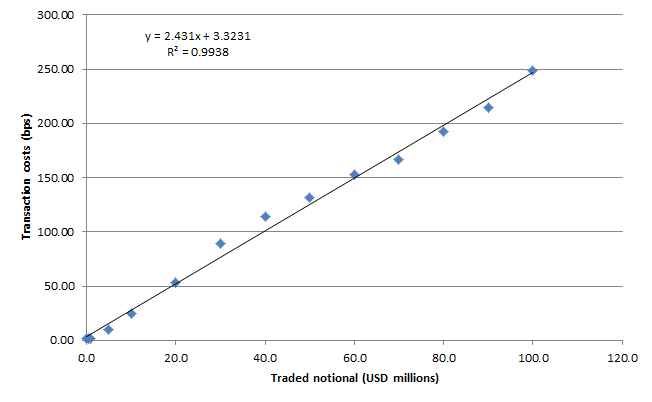 As the figure shows, the relationship is linear in this case (R2 = 0.99), even for large traded amounts. This is due to the high liquidity of the swap contract, being also the most actively traded as of April 2019, with daily traded volume around $1 billion. There are 5 main ways to trade cryptocurrencies and hedge crypto exposures: cryptocurrencies present a significant amount of risk because of their volatility (~100% annualized). It is thus important for crypto holders considering hedging part or the entire amount of their crypto holdings with one of the five methods outlined before. 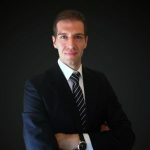 Each one of them has both pros and cons, so the investor should consider its own particular situation and possibly consult with an investment professional to choose the most effective technique. It is important to choose the most appropriate hedging technique considering traded notional and its related transaction costs: when trading and hedging large amount of cryptocurrencies, it is important to perform a transaction costs analysis (TCA) to choose the least expensive method. 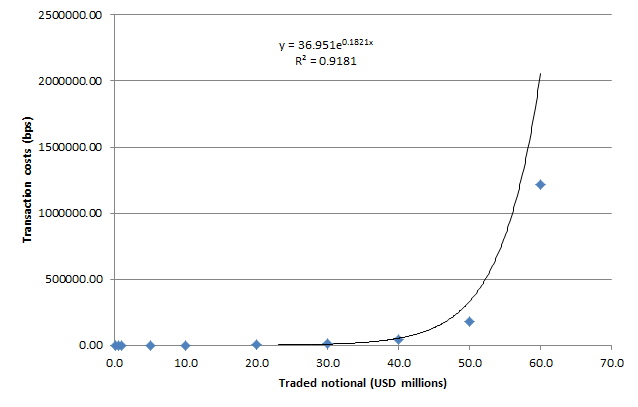 We have in fact determined that for all methods except swaps the transaction costs due to market impact are in fact exponential with respect to traded notional. An investor should then consider the amount expected to trade in order to minimize its trading and hedging costs.